One of the most extensive archaeological sites in Egypt, it was the cemetery for Memphis the capital of ancient Egypt. Sakkara is one of the most extensive archaeological sites in Egypt, it was the cemetery for Memphis the capital of ancient Egypt. Yet again it is one of the very virgin archaeological sites. despite the fact that we found so many monuments in Sakkara . 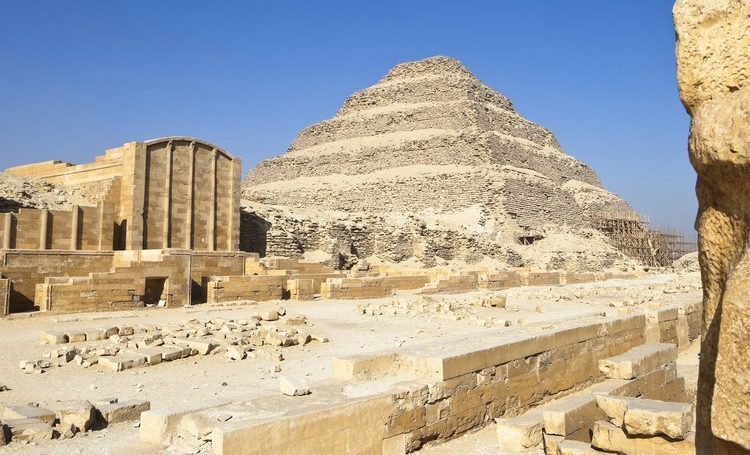 Sakkara is dominated by the step pyramid of king Zoser that goes back to 2700 BC. It is one of the oldest stone structures in the world. Sakkara is also the site of many tombs from the first and 2nd dynasty. Mostly made out of mud break other tombs that are made of limestone decorated with daily life scenes. When you are in Sakkara, you will notice that Sakkara is divided into southern Sakkara where it is dominated by the step pyramid and northern Sakkara dominated by the pyramid of king Titi and mastaba tombs of the old kingdom. The step pyramid of king Zoser and it surrounding complex. The pyramid of king Titi. The tomb of Meriruka and the tomb of Kagimni. The mastba tomb of TI and the tomb of Petah hotep. It was built for king Zoser to be a tomb, today is considered as one of the oldest stone structure built by men in the ancient world and the first time the ancient Egyptians would attempt to use limestone. King Zoser is considered as one of the greatest kings of the third dynasty (2721-2780 BC). This pyramid was designed and built by his great architect Imhotep. The pyramid is built as step pyramid, raising the height of 60 meters and consisting of 6 steps on top of each other each is smaller than the one below. The pyramid is entirely built of limestone. They used small bricks of limestone, yes it is not he best quality of stone but it remained for more than 4700 years. The pyramid is surrounded by a rectangular enclosure wall that measure 277*544 meters mostly ruined today but it was originally ten meters high. You will be able to see parts of it. In the southern eastern part of the wall you will find the entrance to the complex, most of what you are going to see when you get through this door is recently restored! Notice at the end of the little hall that the door leads you to , there is a an imitation of two doors swung open. The entrance leads you to a colonnade that has 40 columns. Each columns is attached to the wall behind, the style of such columns are called engaged columns, they were built to ensure that these columns would be able to endure the heavy weight of the ceiling. You will notice in between the columns there are large numbers of little rooms created in between, they once contained statues representing king zoser as ruler of upper and Lower Egypt. The long hypostyle hall leads to an open court yard. This vast empty space was to be used by the king performing the rituals of the jubilee feast called the Hep-Sed festival. One of the rituals performed by kings of Ancient Egypt to ensure that they are able to rule the country for 30 years to come. To the right wing of the open court yard, Imhotep the architect of king Zoser built a temple known as the Hep-Sed temple, for the king to be able to practice that ritual in the after life. Behind that temple further north you will notice two building behind each other they are called the northern and southern house where the king is supposed to host those dignitaries who have come to attend the king’s ritual in the temple and his recognition as a king of upper and lower Egypt. The pyramid’s four sides almost face the four cardinal points. The original entrance of the pyramid is located at the northern side. The pyramid is closed for visitors since a very long time it is not safe to get inside this pyramid. I frequently was admitted inside this pyramid with many TV crows that I have leaded around Sakkara, we had to get a very special permission to get inside. The northern entrance is not used anymore it is very dangerous; mainly the people use another one that was made the time of the 26th dynasty at the southern reside of the pyramid. When you go underneath this pyramid you will there is strange feeling that haunts you , when you keep in mind that you are exploring 4700 years of time . yet down there is like a maze , there are hundred of little corridors and virtually it is like maze of little tunnels. We found in some of these tunnels more that 30, 000. Jars made out of several types of stone, like alabaster marble, diorite and slate. To the southern side of the pyramid, you will find burial shaft almost 28 meter deep is believed to be a symbolic tomb for the kind, as kings of the first three dynasties used to build tow tomb for themselves one is a real tomb and the other one is just a cenotaph. Next to the step pyramid complex on the southern side you will see the ruined pyramid of king Unas, dates back to the end of the 5th dynasty. It is the first pyramid inside of which we find inscription decorating the walls of the burial chamber, they are more than 700 incantations which are supposed to help the dead king throughout the afterlife and they are known as the pyramid texts. When you get inside this pyramid the inscriptions on the walls of the burial chamber are awesome. Unfortunately the pyramid is closed since more than 6 years ago. It is the largest tomb in Sakkara, it was built for Meriruka and his family and today considered as the largest tomb in the southern Sakkara, it consists of 32 rooms. The tomb was discovered at 1893, it is located 20 meters to the north of the pyramid of king Titi. The tom goes back to the time of 6 dynasties (2240 BC). The tomb is divided into sections where he and his wife and son are buried. The walls of the tomb are decorated with marvelous daily life scenes illustrating the daily life in Ancient Egypt. It is full of many details of Meriruka with his family and servants.